I write today to update you about some of the work my office has been doing to make your graduate student experience better, and to share news about some immediate steps and a long-term plan that will bolster our efforts. Last April, when Chancellor Cynthia Barnhart brought together the offices of graduate and undergraduate education, she asked us to enhance existing services and identify new ways to provide every student, from orientation through commencement, with an exceptional student life and learning experience. To help us meet our charge, we have been listening and responding to your ideas and concerns, and we have started to build stronger connections between members of my team and the Division of Student Life (DSL). For just about a year now, I have been meeting with graduate students in small and large groups to hear directly from you about what’s working and what’s not. I know that Vice President and Dean for Student Life Suzy Nelson did the same when she started in her role nearly two years ago. We both came away from our conversations with you encouraged by the goals students and administrators share: together we want to strengthen the support network for graduate students and their families; we recognize the need to address pain points associated with the cost and supply of housing, and we are committed to enhancing diversity and inclusion, advising, and professional development programs and services. For several years now, graduate student leaders have identified the lack of parental leave as an area MIT should address in order to better support the graduate student community. The Institute currently grants up to two months of paid Childbirth Accommodation (CBA) for a student giving birth. Effective September 1, 2018, we will expand our policy to include Parental Leave so that all parents who have significant responsibilities for a newborn or a child newly placed with them through surrogacy, adoption, foster care, or court order will be eligible for one month of leave, which will be a paid leave for those currently supported by a RA, TA, or fellowship. For a birth parent eligible for CBA, the new Parental Leave policy will bring their total potential leave duration to three months. To learn more about this benefit and how to apply, please read the policy and a set of Frequently Asked Questions. You can contact your department’s graduate administrator or the Office of Graduate Educationat grad-ed@mit.edu with any questions. In the fall, Chancellor Barnhart, Provost Martin Schmidt, and Executive Vice President and Treasurer Israel Ruiz responded to the findings of the Graduate Student Housing Working Group’s interim report by committing to add at least 950 beds to our 2016-17 graduate student housing stock. The working group will release an updated report, and start to solicit feedback from the community, before the end of the current semester. As chair of the group, I can share that we will be proposing a rigorous assessment of needs every three years, and an annual review of progress; both efforts will engage graduate students, faculty, and staff in a collaborative process so that we can stay on top of your housing needs and measure the effect of our efforts to mitigate cost and access issues. As you may know, a 3% increase in stipend rates will be implemented in the upcoming academic year, which exceeds cost of living (COL) increases by about 20%. We worked with the Graduate Stipends Committee, which consists of faculty, staff, and students from the Graduate Student Council (GSC), to determine that COL rose by approximately 2.45% last year, and to examine other issues such as cost to grants, competitiveness, and community equity. While we were able to increase stipends above COL, we know we have more work to do to alleviate financial stress for some members of our community. Throughout the current academic year, the MindHandHeart Department Support Project has partnered with several departments to make MIT’s academic environments more welcoming, inclusive, and respectful. The pilot, which is sponsored by Provost Schmidt and Chancellor Barnhart, will expand next year so that more academic leaders will have access to the data insights, best practices, and resources that can make their classrooms and labs places where diverse communities grow and flourish. In addition, Professor of Aeronautics and Astronautics David Darmofal is now leading a group of students, faculty, and staff responsible for developing proposals to enhance the exploration of, and access to, a broad range of careers. At the same time, Director of Career Services Deborah Liverman is chairing the Graduate Student Professional Development Working Group, and is closely examining our current professional development programs with the goal of producing recommendations for change. I look forward to sharing both groups’ reports in the coming months, and to implementing the improvements I anticipate they will call for. This roadmap is rooted in what you’ve told us matters most to you. It has also been shaped by input from the GSC. And it is designed to give you a direct sightline into the initiatives my team, DSL, and other campus partners are pushing forward in order to best serve the interests of the MIT graduate student community. I have asked our new Director of Special Projects Lauren Pouchak to dedicate her time to working with you, the Office of Graduate Education and DSL staff, and other community members to initiate or advance the projects included in the roadmap. We will be hosting special office hours on Wednesday, May 30, 2018 from 1 p.m. to 2 p.m. in 7-133 so that you can learn more about the roadmap and how to get involved in the implementation process. I hope that you will stop by to chat with us. You can also provide your feedback through this Idea Bank form or, as always, you can reach out to me directly with your thoughts, questions, or concerns. 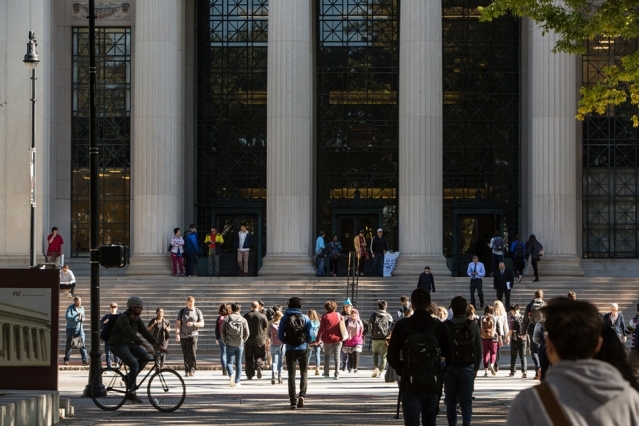 I believe that, by partnering with you on this roadmap, we have a significant opportunity to enhance graduate student life and learning at MIT. I look forward to the work that awaits us.